THE COASTAL town of Essaouira was an escape for Jimi Hendrix and Jim Morrison in the 60s, so perhaps it's little surprise that Dar Beida, meaning white house, has become a haven for chic film and music types. Entering Dar Beida is like being warped into a white cement moulded world where Star Wars meets The Jetsons with Andy Warhol as their guest. It is the vivid futuristic fantasy creation of two British interior designers, owners Emma and Graham Watson. Set over four levels that centre around a courtyard. Kitchen, beds, baths, wardrobes and fireplace pods all sculpt themselves out from walls, while all other furniture mixes mid-century design icons with modern moulded plastic lamps. Centuries old stone arches remind you of where you are as does the medina at your front doorstep. The food markets for whipping up a Moroccan feasts are a tomato roll away and a 10 minute walk will take you to Essaouira's long sandy beach. The house sleeps eight thoughtful touches like a pairs of Moroccan babbouche (Alibababa -style slippers) left out for all guests and local Argan soap in the bathrooms make you feel part of the place. Rustic sun shades cover the terraces slung with the obligatory hammock or two. 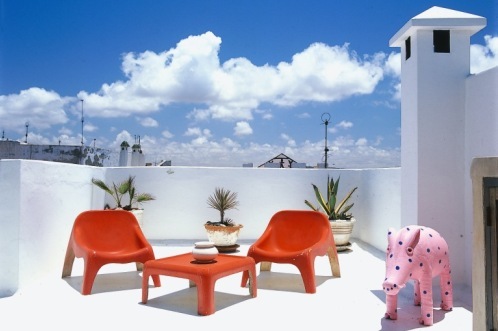 The Luxury Travel Bible is particularly fond of quirky touches such as the large spotted pink pig and moulded red plastic chairs on the roof terrace. The Watson's have created another property, Dar Emma ,which they describe as "a little hippy house" in the very heart of the medina it sleeps four and has a more traditional rustic Moroccan feel, all dark cosy corners and magic carpets. Although there are a few eclectic '60s pieces thrown in. The name of the Dar Beida website pays homage to the Hendrix song, "Castles Made of Sand". A tribute to Essaouira's hippy heyday. This is one of the funkiest places I've stayed in this part of the world, where most houses have a more traditional vibe. Much of the furniture and fittings are genuine 1960s and 1970s pieces searched out by Emma. And I loved the fact of being part of the medina yet able to retreat to my wrapped own space-aged white pod. Typical clients: the young and middle class of cool Brittania but don't let that put you off.